Hey everyone! Today I have swatches of the four OPI Muppets colours featured in the "Muppettes" Mini pack. I have been impatiently waiting for the launch of this collection ever since I saw some swatches at the Touring America launch party I went to back in August and I'm so excited that it is finally available! The Muppettes Minis pack contains one of the six glitters in the 12 piece collection, Excuse Moi! and three of the other polishes. At first, I was a little disappointed that Rainbow Connection wasn't in the pack, and I wasn't sure I liked the other three polishes in there, but after swatching them I quickly changed my mind! Wocka Wocka! 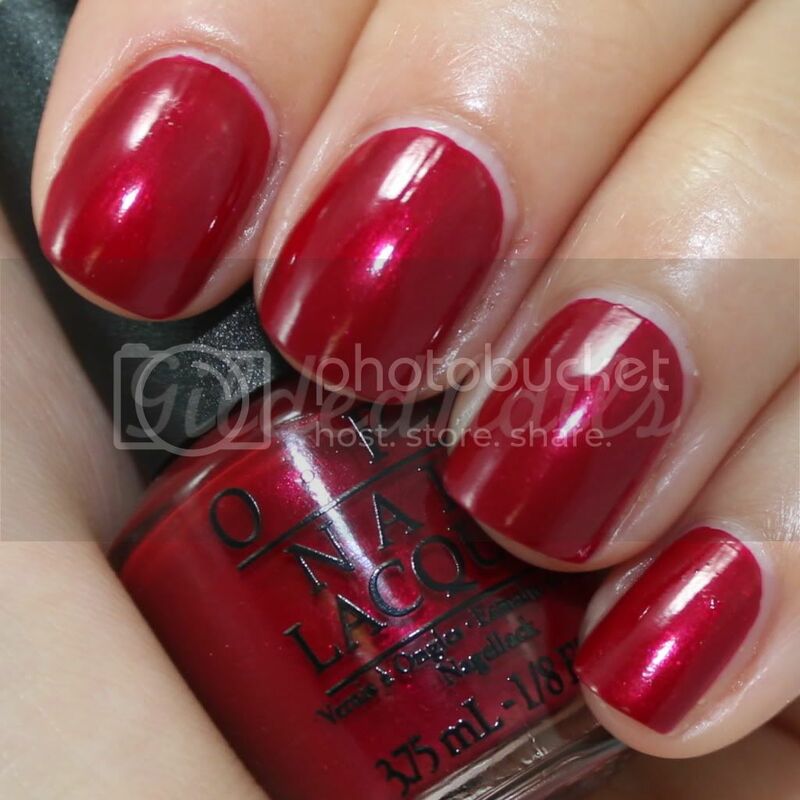 - Rich red with microshimmer. Normally, I wouldn't gravitate towards a red like this because I feel like shimmery reds can sometimes be a little dated, but Wokka Wokka! was pure red perfection. Not only did it look fabulous on my nails, it applied flawlessly with one coat! I used two for the pics just for consistency. I did notice however that the shimmer is more pronounced in the bottle than on the nail, but you could still see flashes of it once applied. There was only one small problem with this polish - it stained my nails big time! You definitely need to wear a base coat with this polish. Overall though, a really great Christmas red! Excuse Moi! - Warm pink jelly-ish base with silver microglitter and tonnes of multi-coloured hex glitter - green, blue, pink, orange, yellow and silver. 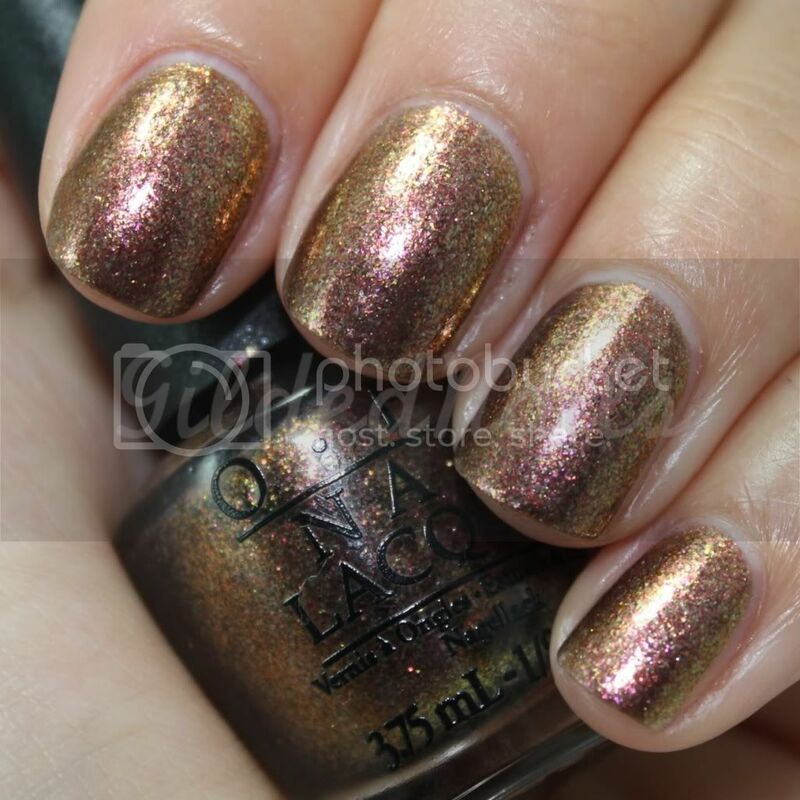 Without a doubt, one of the best glitters OPI has ever created. 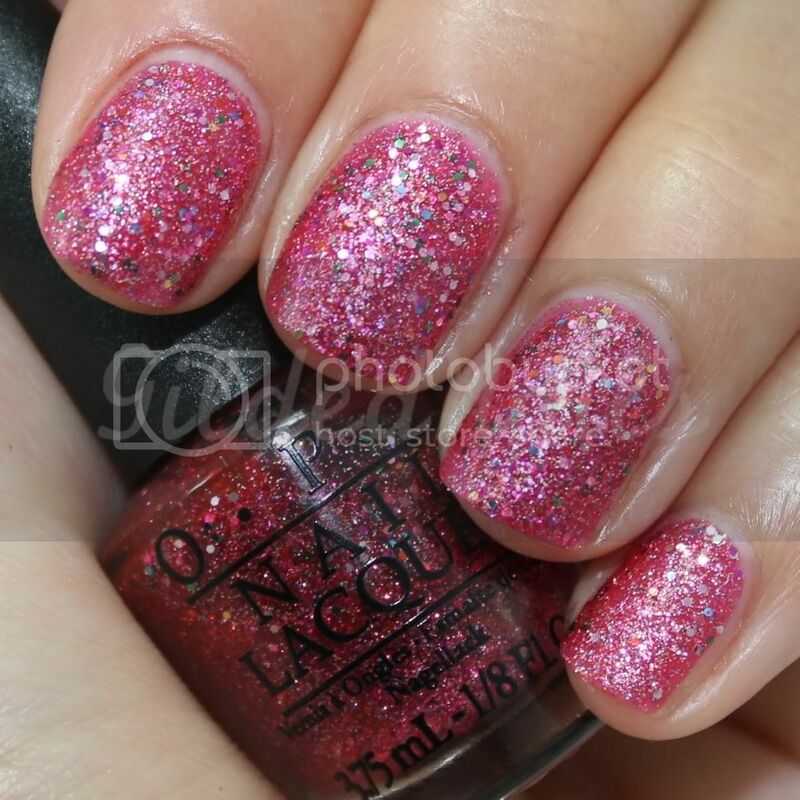 The base colour was ridiculously opaque and the glitter applied evenly over the nail without clumping or dragging. This was only two coats. So pretty! Designer... de Better! - Pale gold/silver foil with sparse copper foil particles. I have about a dozen silver foils in my collection, but nothing like this! I'm really loving this variation on the classic silver foil. It applied really smoothly and only required two thin coats. Warm & Fozzie - Brown-bronze, gold and pink foil particles with a slight duochrome effect suspended in a dark black/brown base. This is a really unusual colour and I was a little unsure whether I would like it or not, but it actually works! Once applied, the foil particles kind of meld together to give an overall gold foil effect with flashes of the other colours. The first coat was a little thin, and I was thinking that three would be necessary, but it only needed two coats in the end. Overall, I'm pretty impressed with this Minis pack. Warm & Fozzie is probably my favourite out of the four because I don't really have anything like it, but Excuse Moi! comes a close second! Since I liked these four so much, I decided to purchase the whole collection! Naturally, when I get those in the mail, I'll do some more swatches. 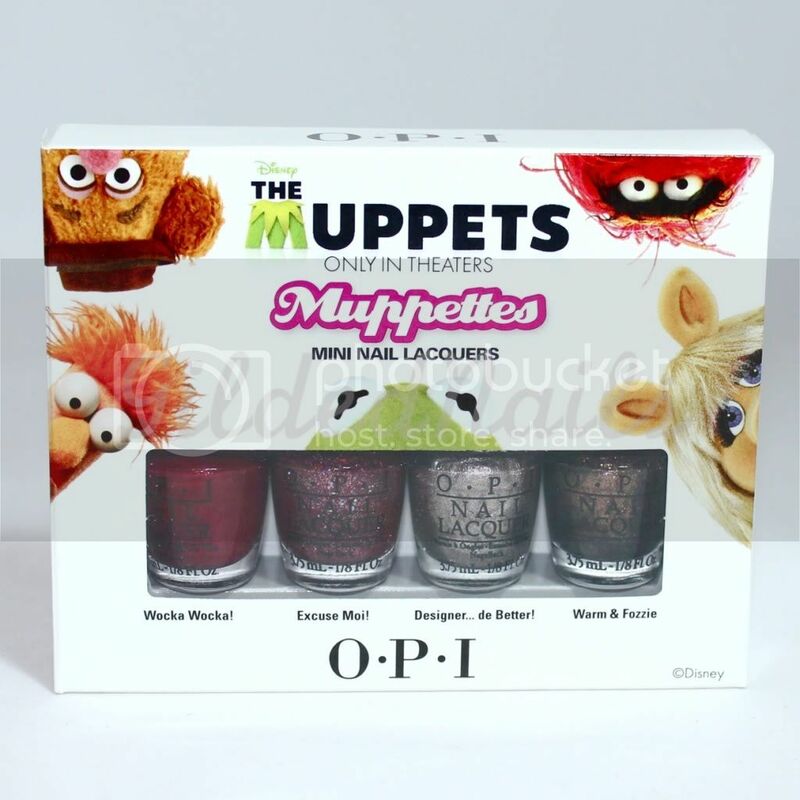 This OPI Muppettes Minis pack is part of the limited edition Muppets Collection which is available at selected salons and David Jones nationally, for $24.95RRP incl. GST. 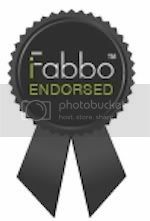 For stockists phone 1800 358 999 or visit www.opi.net.au. Which ones have you picked up? ?